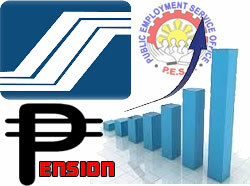 Php2,000 increase in the monthly pension of the Social Security System (SSS) pensioners. The Senate passed House Bill No. 5842 or the Social Security Act, seeking to amend Section 12 of Republic Act 1161 or the Social Security Act of 1997. A bill granting an across the board Php2,000 increase in the monthly pension of the Social Security System (SSS) pensioners. Senate minority leader Juan Ponce Enrile voted against the passage. It is because according to 91 year old senator it may allow our future generation inherit a bankrupt SSS. Recto said the increase in monthly SSS pension will not result in underspending since pensioners will spend their money and boost the domestic economy. Villar cited data from the National Statistical Coordinating Board which pegged monthly poverty threshold (minimum income a family or individual must earn in order to be considered “not poor) for a family of five at Php8,022 per month. Based on the proposed bill, those receiving the minimum SSS pension of Php1,200 per month will now receive Php3,200 under this bill and those who are getting Php3,169 a month will receive additional Php2,000.